USAIE is offering assistance to private companies and universities looking to host cap-exempt H-1B employees on campus, in a manner similar to “Global Entrepreneurs in Residence” (GEIR) programs already operating on campuses around the country. See this info sheet or contact USAIE for more information. The H-1B visa is the most common pathway to working in the United States for hundreds of thousands of international students graduating from U.S. universities each year. However, due to an annual cap of 85,000 for most H-1B applicants, including 20,000 allocated to U.S. masters or higher degreed graduates, most H-1B applicants are unable to obtain one, including entrepreneurs and key employees of startups. This is causing a significant brain drain of international students graduating from U.S. schools and forced to return to their home country. On-campus H-1B incubators, wherein a private company is the employer but the employees work at a college campus, are one way to offer cap-exempt H-1B visas to foreign-born entrepreneurs and startup employees, individuals whose work strengthens and grows the American economy as a whole. 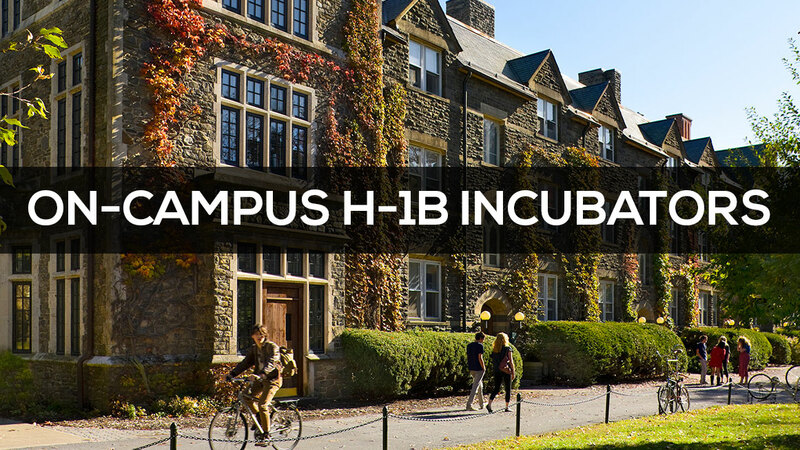 Here is an info sheet with basic information about how on-campus H-1B incubator programs work. Contact USAIE if you have any questions, or you’d like to investigate starting your own. With our expertise in business and immigration law, we can help you navigate the process. USAIE also offers targeted consultations and presentations to individuals, companies, and incubators. Contact us with your questions about immigration law or starting and growing your business in the United States. This entry was posted in News and tagged GEIR, Global Entrepreneurs in Residence, H-1B Visas, On-Campus H-1B Incubators, Universities. Bookmark the permalink.